The campaign to bring a new charity air ambulance to the north-east has soared forward with the creation of a new post dedicated to raising funds for the life-saving helicopter. 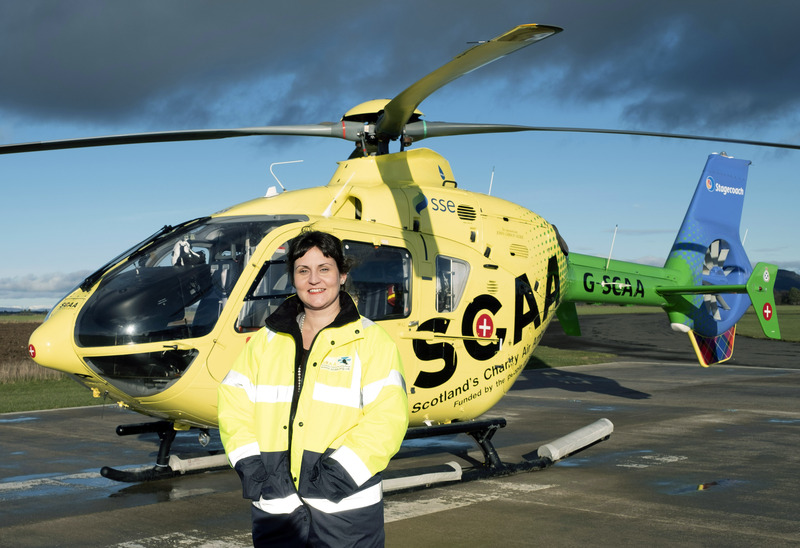 Scotland’s Charity Air Ambulance (SCAA) confirmed plans to base a second helicopter in Aberdeen last November, in addition to its existing one at Perth, and is on a mission to raise £6 million to get it in place by the end of the year. The charity has already collected £2.5 million towards the sum, which will cover costs for the first three years. And Culter woman Cara Baird has now been appointed as the SCAA’s north fundraising manager to ensure the target is reached by the end of the year – and to continue amassing the money needed to ensure it becomes a permanent fixture. Cara Baird, SCAA Regional Fundraising Manager for the North East of Scotland. She was partly inspired to take on the role as her four-year-old son, Luis, suffers from severe asthma so she appreciates the importance of emergency medical assistance being close to hand. Miss Baird said: “My role is to get out there speaking to people and raising awareness of the need for this, and to act as a link between people and the charity. “The helicopter can come to the help of anyone, from people who suffer traumatic injuries in road accidents to those experiencing medical emergencies at home. “I have a four-year-old with asthma and severe allergies, and I’m aware that his situation could turn into an emergency at any time. “So I am just one of thousands and thousands of people who will find it reassuring to know we have this added resource. Ms Baird has already encouraged the fundraising efforts of a Co-op shop in Inverness, firefighters in Laurencekirk and the Banff and Buchan Tractor Club. The location of the new helicopter has also been hailed as a boost for the Highlands and Islands and Moray, and Miss Baird’s role will also take her further north to promote fundraising efforts. The 35-year-old previously worked at Aberdeen University for eight years, gathering donations for the School of Medicine, and spent two years in a similar position at Robert Gordon University. As part of her job, Miss Baird will attend talks to educate people and companies about the work SCAA performs and encourage contributions. People keen to help raise funds can learn more by e-mailing c.baird@scaa.org.uk or phoning 03001 231111. Scotland’s Charity Air Ambulance (SCAA) recently marked a “tremendous achievement” as it responded to its 2,000th emergency call since launching in 2013. The helicopter was scrambled from its base at Scone amid reports that a man was in a life-threatening condition 150 miles away in Stranraer. Once the helicopter and crew arrived, along with Scottish Ambulance Service personnel, the patient was assessed and then airlifted to Ayr Hospital within 20 minutes – a journey which would have taken nearly 90 minutes by road. SCAA chief executive, David Craig, wished the patient a speedy recovery and issued an open invitation for him to visit the base and crew who attended him. Mr Craig said: “Over the years we have helped to save and improve the lives of hundreds of people in extreme situations who require urgent emergency care. “The fact that SCAA has been called on 2,000 times shows the value of the service, which is funded entirely by public donations, and we can’t thank all the people, businesses and communities whose support fuels our life-saving flights enough. “With the continued support of the people of Scotland, we will be there to complete the next thousand calls for help – and beyond. The aircraft at Perthshire is the country’s only charity-funded air ambulance and has become established as a key part of Scotland’s emergency network.